There’s no shortage of things to do in the summer in Toronto. The city comes alive with events of all kinds throughout the warmer months and into early fall, ranging from concerts and outdoor movie screenings, to food-focused festivals and street parties. But not all events are created equal when it comes to who they’re best suited for. Some, like the various beer festivals or night markets happening in and around Toronto might not be ideal for families with younger children. So if you’re hoping to take advantage of some fun events this summer – and you’ll have kids in tow – here are some of the best family-friendly summer events in Toronto. Is there anything better than good food and good music, especially outdoors on a sunny, summer day? Get a dose of both, as well as some family-friendly fun at Canada’s newest food, music and entertainment festival happening on the grounds of Burl's Creek in Oro-Medonte, Ontario. After six years in the UK, the popular festival is branching out to Toronto and offers something for all ages. Music-wise, some of the acts you can check out include Weezer, Ben Harper & The Innocent Criminals, The Strumbellas, OK Go, De La Soul, MAGIC!, Dragonette and much more. In addition, some of Canada’s top chefs will be on hand for cooking demos and classes and you can choose from an array of dishes from local food vendors. There will also be a fun fair for kids, family lawn games and other kid-friendly activities and events. Whether you live in the area or just want to check out a new neighbourhood, the Big on Bloor Festival is a great one for families who can explore a car-free stretch of Bloor Street West between Dufferin and Lansdowne Streets. This annual outdoor pedestrian festival celebrates local arts, culture and community and features a variety of events including live music and entertainment, live mural painting, busker stations, activities and games for kids, local food and craft vendors and much more. Food truck loving families will want to head to Woodbine Park this summer to take advantage of a wide variety of mobile eateries all in one place for the Toronto Food Truck Festival. The list of participating food trucks includes Buster’s Sea Cove, Heirloom Toronto, Tiny Tom Donuts, Jerk Brothers, Alfie’s Lemonade, Vesta Lunch, Gotham Grill and Untamed Chef to name just a few. There will also be live entertainment to enjoy while you eat. Ontario Place will be home to The Art & Music Ontario Festival in early August, which celebrates Ontario’s diverse range of art and music, in honour of the province’s 150th anniversary. This free, four-day festival will feature craft and artisan vendors, art history classes for the whole family, art installations, food trucks, live music and even a drone light show. Canada’s largest street Festival, which welcomes approximately 1.65 million attendees annually, is back for another year of food, fun and entertainment. There will be lots of food on offer courtesy of the area’s many restaurants, and while there will be no shortage of Greek eats, you can also expect a diverse array of cuisines, from Indian to Mexican. Taste of the Danforth also offers live entertainment and dozens of free activities for visitors of all ages. Note that this event gets extremely busy, so it might not be the best option for large strollers or toddlers and young kids who don’t like crowds. Any families with a sweet tooth should think about heading to David Pecaut Square for Sweetery, Canada’s largest sweets festival. As the name suggests, this fest is dedicated to all things sugary. Stop by to pick up a few sweet treats as a family. The Canadian National Exhibition (CNE) is Canada's largest annual community event and currently one of the 10 largest fairs in North America. 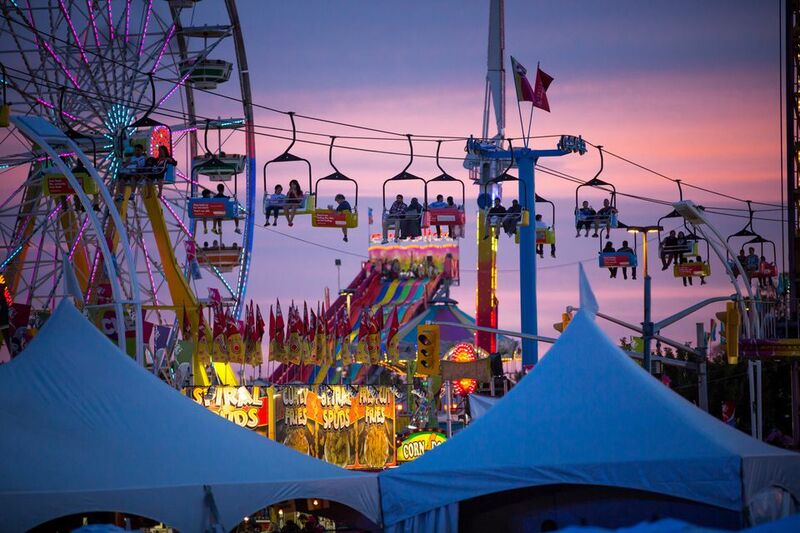 There’s something for the whole family at the CNE, from rides and games, to live music and entertainment, tons of food and events like the popular aerial acrobatics and ice skating show. Younger kids will love the Kiddie Midway featuring 30 rides geared towards the smaller set. The 18th annual Toronto International BuskerFest For Epilepsy is happening at Woodbine Park in the Beach, (Coxwell Ave at Lakeshore Blvd & Eastern Ave). There will be over 100 of the best street performers in the world, from comedians and escape-artists, to sword-swallowers, musicians, magicians, fire jugglers, acrobats, clowns and more. Not only that, BuskerFest features a family fun zone with face-painting, balloon twisting and giant games; a beer garden and the Be A Busker Zone, an interactive area for kids to get some hands-on experience in a few of the arts that buskers perform. Get to know the Kingsway this September with the annual Taste of the Kingsway happening along Bloor Street West, from Prince Edward Drive to Montgomery Road. Over 200 exhibitors will be participating and the fun includes live entertainment on two main stages, a beer garden, midway rides, a bouncy castle, a classic car show, a community dance stage and buskers. Not to mention you might also want to check out Caffe Demetre’s ‘Ice Cream’ eating contests, Kingsway Fish & Chips’ ‘Fish & Chips’ eating contest, and the Scotiabank Dog Show.